So I’ve got good news and bad news. Since you can’t tell me which news you want first (because I wrote this at some point in your past…just think about it), I’m going to decide for you…and my decision is…the good news! Since my last blog post, I’ve become a Daddy for the 2nd time! Harry was born in October and he apparently looks exactly like me, so I make sure to apologize to him daily. Please send your congratulations in the form of babysitting vouchers that my wife and I can use at a day and time of our choosing. If Harry looks like me, then I must be one handsome baby! Now the bad news. And yes, it does relate to Harry (and his oh-so-adorable big sister) which makes this segue that much more impressive. First of all though, the good news about the bad news is that it only affects you if you have kids in $7/day daycare…daycare that now costs $7.30/day. But that’s not actually the worst of the bad news, so here it is in all its horrible glory. If your family income is…between $50,000 and $76,000, you’re going to end up paying $8/day. If your family income is…between $76,000 and about $156,000, you’re going to end up paying around $1.50 more per day for every $10,000 you make over $76,000. The scariest part of all is what I mentioned above – that you won’t have to pay a penny over $7.30/day until tax time comes in April 2016! At which time, you’ll be getting a very nice Easter/Passover/Spring surprise in the form of a very large tax bill that you weren’t expecting. For most people, it’ll be only be around $180 per child in $7.30/day daycare. But if you have 2 kids in $7.30/day daycare and you make over $156,000 as a family, that “surprise” is going to be a bill for around $6,660. Not funny, Mr. Funny Accountant. I know….sorry. 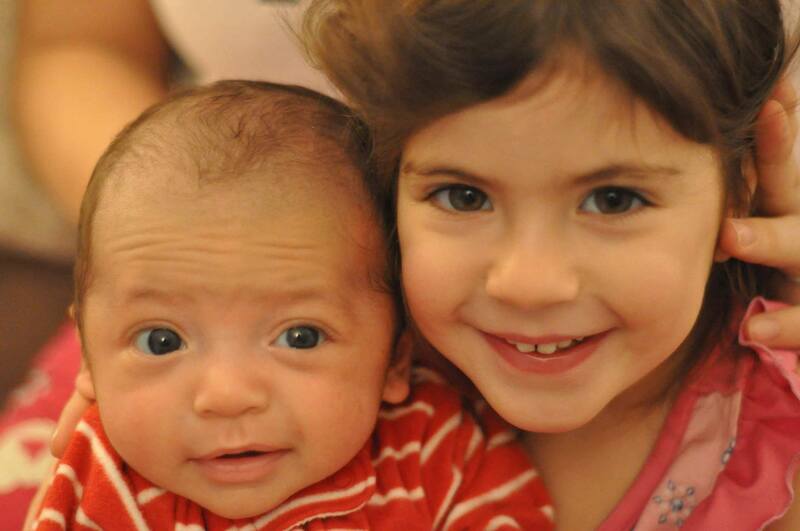 At least you can look at a cute picture of my kids…that should cheer some people up. My son is in $7 a day daycare but “graduates” in September when he begins Kindergarten. Our family income is over 156k. How much will we have to pay? Ballpark…about $275/month, so for January to end of August, assume around $2,200. I’d love $7/day daycare. We pay $1650/month for 2 kids and one is in half day kindergarten. We make maybe 100k/year and don’t qualify for any subsidy. Granted the daycare is amazing and we have tried dayhomes and they have always disappointed..
Trust me that we know how lucky we are here in Quebec with regards to daycare. Even at $20/day, to have quality, subsidized daycare spots reasonably available is a nice perk…although we have to consider our high Provincial taxes in the big picture. Our low daycare rates were designed around a high Provincial tax…to raise the daycare rate now (putting aside for the moment HOW they’re raising the rate) essentially slaps a surtax on a very specific segment of society – families with kids between 6 months and 6 years old. Probably not the best political/economic move given that we represent the future of the Province. Just saying! Sigh. I live in Vancouver and pay $935 a month for daycare for a 3 year old. Maybe we should move to Quebec so we could actually afford another child. Hi, I am so confused about the daycare costs here. My husband doesn’t care, but I care so much since I am a full time mom. I would like to ask you if we pay the same no matter how much the daycare charges us? If the daycare charges us 35 dollars per day, and the family income is around 80,000. can you please give me some idea how much we will need to pay for it per day? I am fine to pay more if I can help low-income families, but sometimes they don’t appreciate it, they think it is our responsibility to pay more tax. Hi Dawn, sorry about the delay in getting back to you. I’m currently finishing up a detailed post on the tax side of Quebec daycare. Stay tuned in the next couple of days! The longer that I live in Quebec the less I like it. Actually, it’s the government that I don’t care for! On top of this situation there’s also the EI issue, language barriers and soooo much more. It’s a slap in the face to all Quebec residents. Thanks for breaking it down for those of us that don’t care for the political jargon. I was seriously lost trying to read the Federal Budget for 2016, lol. Previous Post Daycare and taxes and audits, oh my!! Next Post The Death of $7/Day Daycare in Quebec: What Do I Do? ?